Danacord’s commitment to the art of cellist Erling Blöndal Bengtsson has enriched his discography to a remarkable degree and it’s clear that he was a cellist of great gifts and wide musical sympathies. Utilizing recordings from Swedish radio has given the company the chance to disinter a raft of representative performances across the years. This one focuses on the more modern elements of his repertoire and happily includes some relatively obscure sonatas. Hans Holewa’s Quatrro Cadenze of 1968, heard in this 1971 performance presided over by Leif Segerstam, is a powerful stalking piece, with prominent percussion, vibrantly performed. There’s a discernable kinship with Berg throughout. 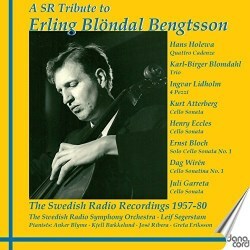 Written just over a decade before, Karl-Birger Blomdahl’s Trio sees the cellist matched with clarinetist Thore Jansson and pianist Kjell Bækkelund. This is a more squarely serial affair, tautly conceived and with no ulterior gloss, though there’s a scherzo vitality in the third movement and a hint of the frantic too, before the Tranquillo finale ushers in some decidedly brooding quietude. Composed in the same year, 1955, is Ingvar Lidholm’s 4 Pezzi, for cello and piano, another four-movement, on-the-cusp work that looks to the tone-row. But its taut athleticism is bracing, its solo cello writing decidedly expressive in places, and here Bengtsson’s control of colour and dynamics supremely good. This marvelously subtle and supple performance shows him at his most sensitive and assured – not that those qualities are at all lacking elsewhere. The first disc ends with the culture shock of Kurt Atterberg’s 1925 Sonata, a ripely late-Romantic utterance, lyrical, enriching, Brahms-leaning. Colin Anderson’s notes go whimsically British in describing Henry Eccles’ Sonata – he references cakes and The Goons – but the sonata is the standard one so beloved of fiddlers down the years (Jacques Thibaud once recorded it) heard in this cello transcription. And splendidly played. Bloch’s memorable Suite for solo cello No.1 receives a commensurately powerful performance, its folkloric and terpsichorean elements at their height in the Allegro finale. The February 1980 tapes are in fine estate. Dag Wirén’s little Sonatina No1, Op.1 dates from 1931 and as so often in this twofer sees the cellist teamed with the excellent and sympathetic pianist Anker Blyme. There sounds like brief tape damage for the first few bars of the sonata but thereafter the 1963 tape sounds good which is excellent as Wirén offers up one of his lovely compact slow movements. To end there is Juli Garreta’s 1923 Sonata in F major, where the cellist is accompanied by José Ribera in 1973. Tuneful and light, romantic and touching, this refreshing and joyful work is very generously proportioned and well worth getting to know. I hope that there is much more from the radio archives to augment this already quite extensive series.